SD Performance labour is warrantied against defects in workmanship only. Warranty on all parts is strictly provided by manufacturer, not SD Performance. No warranty on high performance or racing engines/applications unless specified by SD Performance in writing. SD Performance does not claim that any parts we sell meets any Federal, State, Provincial or Local, safety or emission standards. No warranty on any part(s) supplied by customer or for any damage that may be caused by customer supplied parts. 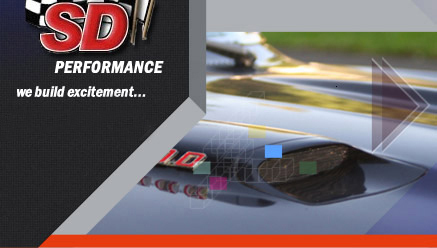 Upon inspection by SD Performance, warranty is null and void on any component that has been dis-assembled, improperly maintained, over heated or raced. All returned items or cancelled orders are subject to a 20% restocking charge. Any and all return freight or shipping charges are the responsibility of the buyer,unless prior arrangements have been made with SD Performance. Any item returned must be approved with an authorization number from SD Performance or said item(s) can and will be refused and buyer will be subject to charges. Any and all Special Order items are Non Returnable, unless prior arrangements have been made with SD Performance. Store credit only on any returned item(s) unless prior arrangements have been made with SD Performance. Fifty percent deposit is required on any cylinder head package with balance due upon completion.Parts orders require a fifty percent deposit with balance due before shipping. In any event, no product will be released without full payment. SD Performance is not responsible for any finished goods/ items that are left unpaid by customer at SD Performance for 30 days or more, further more, SD Performance retains the right to sell, without prior notice, any finished goods/items that are left unpaid by customer at SD Performance for 30 or more days unless prior arrangements have been made by customer with SD Performance. SD Performance reserves the right to make changes or adjustments to any and all of the above policies at any time with out notification.